Starting September 13, 2017, DTS will begin releasing weekly security updates on all district-owned Mac and Windows computers. Applying these updates is an integral part of keeping staff and student devices secured and working properly. Also called “patches,” security updates will be tested before being deployed to district devices to ensure that core functionality is maintained and to minimize any loss of instructional time. Updates will be suspended for lab computers during state testing. Updates will be automatically pushed out to computers every Wednesday. 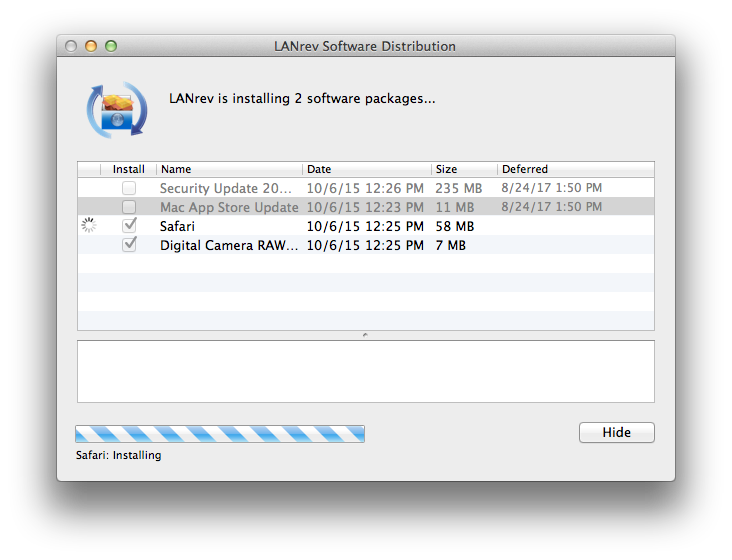 Notification of available updates will be provided through the LANrev management console. 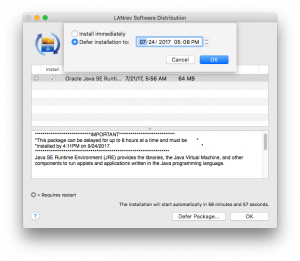 You may choose to defer updates for up to two weeks and will receive a pop-up reminder every ten hours until the deferred updates are installed. The install will start two hours after the pop-up appears if no action is taken. If you want to install the updates when the dialog pops up, click OK to start the install. Note: The machine must be connected to the District’s wired or wireless network for the updates to install. 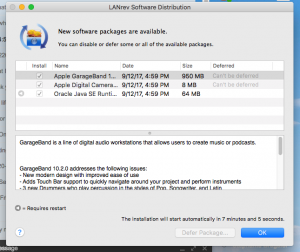 In the example above, the Apple GarageBand and Apple Digital Camera update do not require a reboot, so they can not be deferred. 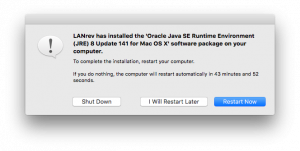 The Oracle Java update requires a reboot and can be deferred. To defer the Java update, select the Java update and click on the Defer Package button. A screen like this will come up. 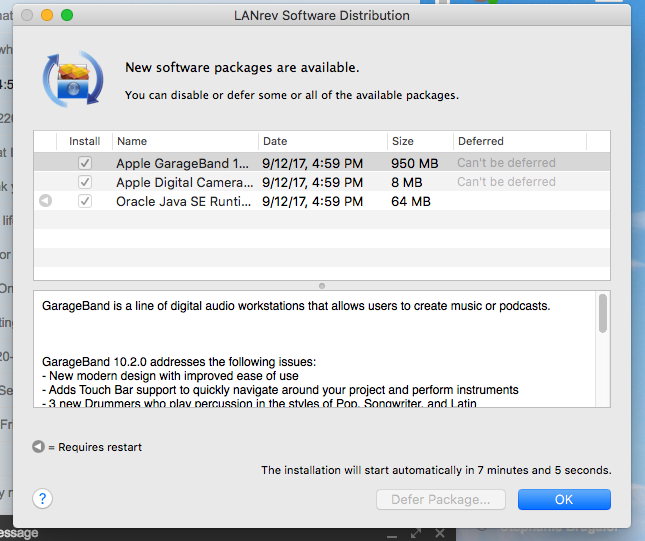 You can set a time up to 10 hours from when the dialog came up. If you enter a date and time beyond 10 hours, the system will automatically adjust it back to 10 hours. After you click OK, a screen will come back up showing the deferral time. Click OK and the screen will close. If there are other updates that don’t require a restart, they will start to install once you click OK. LANrev will prompt to install the deferred updates at the time you specified. 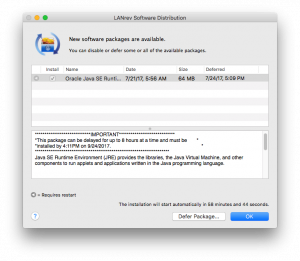 If you let the dialog sit, they will start when the timer reaches 00:00:00. We recommend that updates be installed as soon as possible to ensure system security and availability. Most updates will be seamless, though more critical updates will require additional time and, in some cases, a computer restart. A message will prompt for a system restart if necessary, and this process may be delayed for a few minutes. If you defer the restart, the dialog will reappear in when 5 minutes remain before the restart. Some of of these updates may be large, so devices should be plugged into a power source and charging to ensure successful installation. This patching effort aligns with IT security best-practices. Our hope is that as the school year progresses that these updates will become a familiar process.